From Platinum Passes and the Moneymaker Tour to SECOOP and a live-streamed win for Team Online’s Kevin Martin, here’s your weekly round-up of content from the PokerStars Blog. The closer we get to the end of 2018, the nearer the PSPC draws — and that means it’s time to start choosing the last round of Platinum Pass Adventure winners. Jen Shahade picked the winner of her #MyChessPokerGame contest, which tasked entrants with creating a new game that combines chess and poker, live on Twitch while judges Liv Boeree and Daniel Negreanu played a game of chess. Warren Sheaves won for his game, Chess Draw. 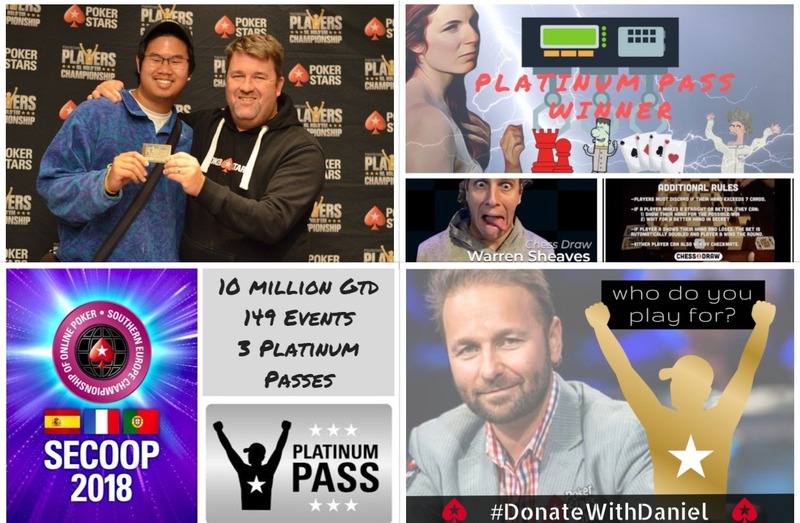 Just a few days later, Daniel Negreanu chose the winner of his #DonateWithDaniel Platinum Pass Adventure, which asked entrants to tell him about a cause close to their hearts that they would pledge 50 percent of their winnings to if they were chosen to play at the PSPC. Jord Matthews of Ireland, who won the contest, went above and beyond, pledging to split any winnings equally between two mental health-related charities. Daniel went above and beyond, too, pledging another $10,000 to the causes chosen by the other four finalists. Nitis Udornpim is the latest Moneymaker Tour champion to earn himself a Platinum Pass. Nitis won at Live! Casino in Baltimore, Maryland, earlier this week. “Let’s just say that Michael, the guy wearing a uniform and a badge, wasn’t the only person dealing at that table. There’s a video running down the whole weekend right here. There was some excellent news this week for all those poker players in southern Europe who wanted to play WCOOP this year but couldn’t: a new series just for them is on the way in a few weeks. SECOOP, which is open only to players in Spain, Portugal, and France, runs from October 28 to November 12. Featuring €10 million in guaranteed prize money over 149 events, with buy-ins starting from just €5, the series will also award three Platinum Passes. Check out all the details here. Team Online pro Kevin Martin enjoyed quite a run in this week’s $109 Monday 6-Max [Late Edition], $35k GTD. A total of 414 players turned out for a $41,400 prize pool, with $7,466 awaiting the winner. That turned out be Martin, who made some great decisions while he streamed live on Twitch. On the other side of the planet, a player from the African nation of Benin was pulling off a first. NhPokah won The Open two weeks in a row and, as such, became the tournament’s namesake for the following week. And then, in the first chance to do so, NhPokah went and won The NhPokah Open — the first time anybody has ever managed the feat. The Human Lie Detector contest continues this week with a new guest star. After hosting Andre Akkari in Week 1, Daniel Negreanu (the Human Lie Detector) welcomes Maria Konnikova into the hot seat for Week 2. Maria gives answers to three questions posed by Daniel Negreanu, whose job is to spot which of the three answers is a lie. Check out the post here for your chance to win a ticket into an exclusive freeroll that will award a $30,000 Platinum Pass to the winner, along with $3,000 in runner-up prizes and tournament tickets galore. This week’s episode Poker In The Ears is a little different than usual. There’s no TV Recap and no Superfan, just the story of Eric Audé, the American actor and poker player who was duped into smuggling opium out of Pakistan and spent three years in prison there as a result. This is one you’re definitely going to want to check out. On the much less serious side of all things PITE, the Poker In The Ears Freeroll League avoided another #DisasterNight and pulled off its second game Monday night. (And while they were playing, Arlie completed his sixth labor live on Twitch.) Check out the round-up and new standings here.